"People have been asking what exactly I'm doing at the moment. Well, I'm getting back in the studio, having tried to make myself rest after the tours. I'm writing, mostly just putting ideas down rather than complete songs. "I like to create all sorts of moods with my music and then decide later how they might be used. One specific piece, though, is for the 'CSI' ['Crime Scene Investigation'] TV series that will be aired in the U.S. on November 9th. "I was asked if I'd be interested, so I had a look at the footage and came up with an idea they seemed to like. It's not very long, but it was different working with images rather than just music. I'd certainly be up for doing more." BLACK SABBATH's track "Dear Father", from the band's latest album, "13", was featured in an October 2013 episode of "CSI: Crime Scene Investigation". In addition, BLACK SABBATH made a rare television appearance when it performed a new song on the season finale of "CSI: Crime Scene Investigation". The episode aired in May 2013 on CBS-TV. The band world premiered a cut called "End Of The Beginning" from "13". The episode's plot followed the CSI team as they investigated a series of murder that resembled the sins in "Dante's Inferno", with the trail leading the detectives played by Ted Danson and Marc Vann to attend a SABBATH concert. "I'm not an actor," said SABBATH singer Ozzy Osbourne. "It's like a hurry-up-and-wait. When you see it on TV, it's all done, but when you're filming, there's a lot of stuff going on." He added about the band's return to the spotlight: "It's been a long time, but the wait has been well worth it, 'cause the album is really good. I'm really pleased with the outcome. "It's good fun and it's a good way of telling people that we're back together, you know?" 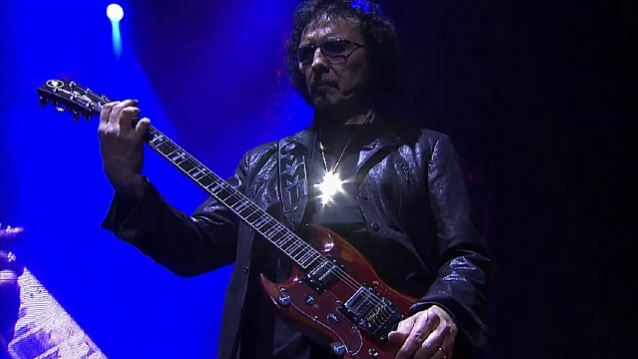 Iommi revealed in January of 2012 that he had been diagnosed with lymphoma, which is described by the Mayo Clinic as "a cancer of the lymphatic system, the body's disease-fighting network." He had to go back to England every six weeks for treatment, forcing him and SABBATH to work around both the treatments and the recovery time needed afterward. "13", the first SABBATH album since 1978 to feature Iommi, singer Ozzy Osbourne and bassist Geezer Butler, was No. 1 in the U.S., the U.K. and nearly a dozen other countries. SABBATH has used Ozzy's regular touring drummer Tommy Clufetos since then for live work. RAGE AGAINST THE MACHINE's Brad Wilk laid down the drum tracks on "13", which came out in June 2013.